David Amerson speaks at CSW rally. Two District of San Francisco New Orleans (SFNO) students from San Miguel High School in Tucson, Arizona were featured speakers at separate public events held in conjunction with Catholic Schools Week 2019. 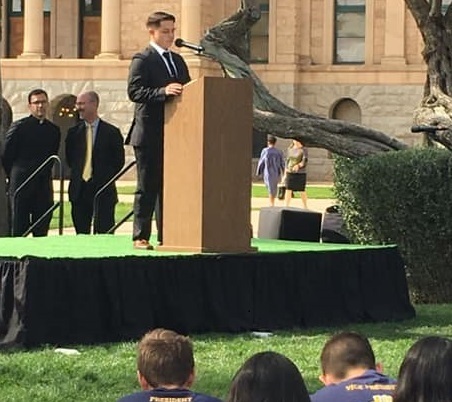 On January 31, senior David Amerson addressed an estimated crowd of 1,000 attendees gathered at the State Capitol House Lawn for the Diocese of Phoenix’s Catholic Schools Rally. 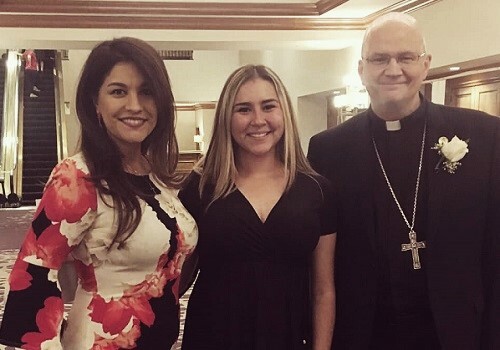 The following evening, junior Jennifer Cuevas was the student speaker at the Arizona’s Catholic Tuition Support Organization (CTSO) 20th Anniversary Dinner benefiting Catholic education, held at the J.W. Marriott Star Pass Resort in Tucson. Numerous area Catholic school students and teachers and area Church and civic dignitaries attended the events, including Diocese of Tucson Bishop Edward Weisenburger. Both Jennifer and David serve as Student Ambassadors at San Miguel. The Student Ambassadors Program selects students to represent San Miguel and increase public awareness and engagement of the school within the Tucson community. Amerson with family and Bishop Weisenburger. David spoke on his involvement in school clubs and organizations, and on the role that the Catholic education he has received at San Miguel has played in setting the stage for his future. 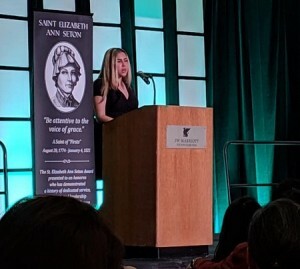 Jennifer’s remarks a day later gave similar testimony to her San Miguel experience and expressed the special reasons behind her appreciation for the opportunities afforded to her by Lasallian Catholic education. Jennifer Cuevas at the CTSO Dinner. 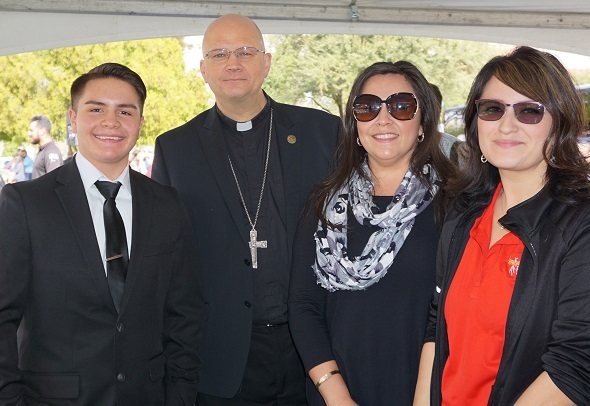 Cuevas (C) with Lopez-Santiago and Bishop Weisenburger. All photos and portions of this story contributed by Paloma Lopez-Santiago, Vice President of Advancement, San Miguel High School, Tucson, AZ. Read David Amerson’s complete remarks. Read Jennifer Cuevas’ complete remarks.